Capps Cemetery is located north of Colorado Springs on the U.S. Air Force Academy grounds. Leaving 1-25 at exit 150, turn west on Academy Boulevard, go through the south entrance gate of the academy (the road here turns into South Gate Boulevard and then Stadium Boulevard); follow the road for 2.9 miles, turn west on Community Center Drive and proceed for one mile, and turn right on Capps Drive and proceed for 0.2 mile. Staying in the left lane, go behind the car wash, then turn left on the dirt road and proceed for approximately 0.2 mile. According to GPS-derived geolocation (accurate to within 10 meters), the cemetery's coordinates are latitude 38°59'25.2"N and longitude 104°51'24.0"W.
The five graves were moved to the present site in the early 1960s. 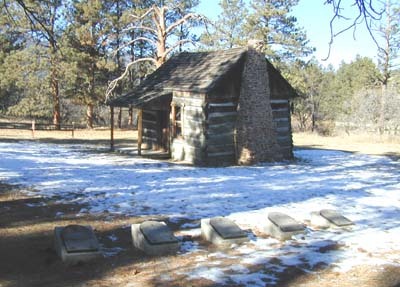 According to records at the Academy library, William Alexander Burgess, who lived there until his children were grown, built the historic pioneer cabin adjacent to the graves between 1871 and 1877. One source says the Leonard Capps family then moved into the cabin, although an Academy history says Capps had his own cabin. Indeed, the 1870 census does show the Capps family living in this area, but no William Burgess is present in El Paso County. According to General Land Office records at www.glorecords.blm.gov, Capps received land patents in the area in 1872 and 1890, and Burgess received patents in 1884 and 1891. 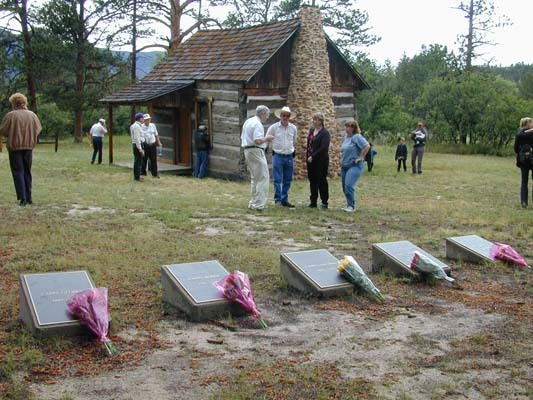 A splitrail fence surrounds the cabin, located in the northwest corner, and the cemetery, located in the southeast corner. The surrounding area is a beautiful forest setting. The U.S. Department of the Interior has placed this area on the National Register of Historic Places. When the graves were moved next of kin were listed as Mrs. Clarence Bishop, Clara Shubarth, Sidney Capps, and Timothy Capps, all of Colorado Springs. A compelling case is made by Mike McCarthy and Gladys Rumbo, descendants of Leonard Capps, that the marker labeled Sarah Capps 1818-1896 should be inscribed Mary Ann Capps, 1819-1890. Mary Ann Bonine was Leonard Capps's wife. She was born in 1819 in Tennessee and died 8 June 1890 near Husted, a small town on what is now Academy property. A Colorado Springs Gazette article titled "Graves on Academy Site Those of Early Settlers" (December 23, 1954, page 13) identifies the couple buried here as Mr. and Mrs. Leonard Capps. It quotes Wilbur Doughty, who said his father, John, helped bury the Cappses and "had made the coffin for Mrs. Capps, who died first," and that his mother helped prepare her body for burial. Mary Ann's death notice, which identifies her as the wife of Leonard K. Capps, appears in the Gazette, June 20, 1890, page 4. Mary Ann is never called Sarah in census or other records, McCarthy says. Leonard and Mary Ann did have a daughter Sarah, born in Arkansas circa 1858-60. She married Frank Sens on 25 December 1877 in Colorado Springs. It is not known when or where she died, but she was deceased by the time her father's estate was administered. 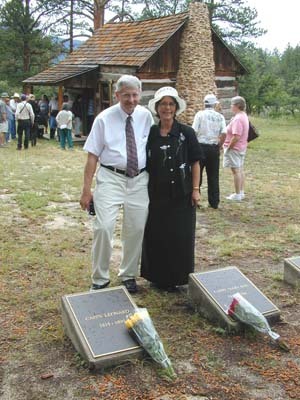 Descendants of Leonard and Mary Ann Bonine Capps gather at the cabin and gravesites on 26 June 2004. Pictured with Leonard and Mary Ann Capps's new markers are Mike McCarthy and Gladys Rumbo.